Uganda is faced with many sanitation challenges one of which is lack of appropriate technological options especially for people in areas with high water table and rocky grounds (Kakuru & Batega, 2010). In such places, pit latrines cannot provide an adequate sanitation solution because they either collapse or the rocky ground makes it very hard and expensive to excavate pits (ATC, 2011). The national sewer system caters for only 6.4% of the urban population (MWE, 2013). Amidst, the wave of urbanization has led to people living in small plots of land where they cannot afford to construct a latrine twice. They therefore construct harmful hanging toilets, which are often opened and release untreated sludge in the environment. Other undignified sanitation options commonly used include ‘flying toilets’ and open defecation (Isabel et al, 2011). Access to safe sanitation is a human right and therefore, people need toilet solutions that provide safety, comfort and protect the environment. Ecological sanitation has for over a decade been promoted in Uganda to bridge the technological gap. The tiger Toilet is an addition to the ecological sanitation menu. The Appropriate Technology Centre for Water and Sanitation, Water for People, Oxfam International, PriMove India under the overall coordination of Bear Valley Ventures Limited UK are undertaking research to profile the viability of the Tiger Toilet as a safe and sustainable sanitation solution. This research is concurrently carried out in Uganda, India and Mymnar. 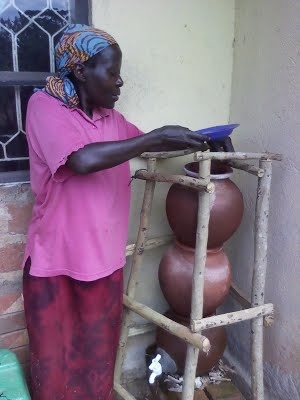 The Tiger Toilet experiments in Uganda were set up in February 2014; with demonstrations constructed in three villages i.e., Buguju, Ngandu and Kigombya all in Mukono district. These facilities are under close monitoring with monthly analysis of influent and effluent samples. This exercise will go on for at least one year however; pit filling and emptying may take more than 2 years.